Shown pictured are Ron Toler, treasurer, Gallia County Little League Baseball Program, Karrie Davison, senior public relations and communications coordinator, Holzer Health System, and Chris Toler, Gallia County Little League Baseball board member. 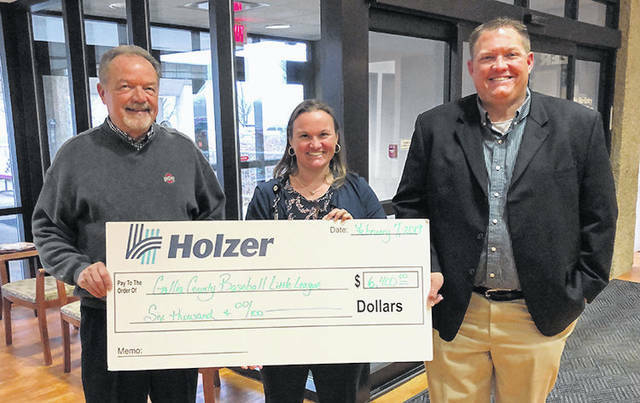 GALLIPOLIS — Holzer Health System is a sponsor this year for Gallia County Little League Baseball Program and the players who participate in the chartered Little League International program. For the last three years, Holzer has made it possible for players to participate without paying a fee. The Gallia County Little League is open to any child between ages eight and 12, with expansion projected to include 13 to 15-year-old children this year. The Gallia County Little League Baseball Program began four years ago with one team, and has grown to at least four teams in the eight-10 bracket and four teams in the 10-12 bracket each year since. Player evaluation will be held on Feb. 24 and March 3 at the Gallia Academy High School with Coach Justin Bailey running the evaluation. Players will be split up evenly on teams and begin play in April. The program will play league games from April to June, with All-Star teams being formed to compete at the district, state, and national Level. Detailed information about participation is available to all who are interested and all areas in Gallia County are eligible to participate in this sanctioned program. Call 740-339-2683 or email citvrec@gallipoliscity.com for more details and applications.